Planning for weight loss? 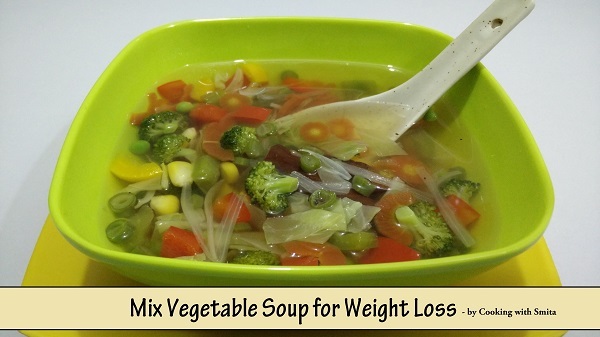 Try this recipe of Mix Vegetable Soup for Weight Loss. It is loaded with vegetables and low in fat. Replace this soup with one of your daily meal. It will help you to reach your goal. Heat 4 cup water in a pan over medium flame. When water is slightly warm, add Cinnamon, Garlic and Spring Onion White. Cook till water starts boiling. Add vegetables – Sweet Corn, Green Peas, Beans, Carrot and Broccoli. Stir once and cook for 2 minutes. Add Salt, stir and cook for another 2 minutes. Switch off the Gas and add Black Pepper Powder and Lemon Juice. Replace this soup with one of your daily meal, it will help you to loose weight.